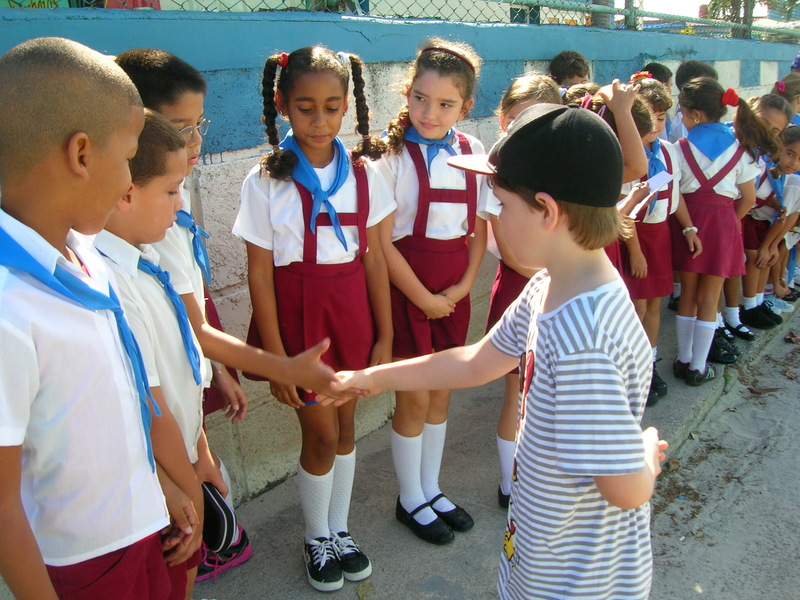 Hard to believe, but I was able to setup a visit to a Cuban school for my 9-year old son, while vacationing in Varadero… Here’s the story. Growing up in Communist Romania, I was fully aware of the invisible line separating Western tourists and the regular folk. Westerners visiting Romania in the 1970s and 1980s were served by a retail network in their own currency, branded “SHOP” (“where did you get that Marlboro from?” “got it from THE SHOP” was a sign of power in Communist Romania), and there was no way for a regular Romanian person to freely interact with them. We knew that her daughter is in Grade 2 at Varadero’s public school (there are only public schools, of course, in a Communist country). We also knew it is an unusual request, as she has to be careful on where she sets the limits of her interaction with tourists at her workplace. But there was mutual trust between us – over the last few years we travel at the same resort in Varadero, and the main reason is the way she takes care of the kids at the resort, unlike other Kids Clubs we have visited in the past in the Caribbean. She promised she will talk with the teacher at school – Cuban kids don’t have a March break at the same time as Canadians – so we would see the kids during regular school hours. And then she came back with good news: “they are waiting for you on Thursday”. The kids and their teacher were beautiful! While we were not allowed on the school grounds – they offered to take our son only and he wouldn’t go without us; I would expect they would do the same at my son’s school in Toronto when someone shows up at the school this way – the Grade 2 kids joined us at school’s entrance, on the short path leading from the main strip to the beach. 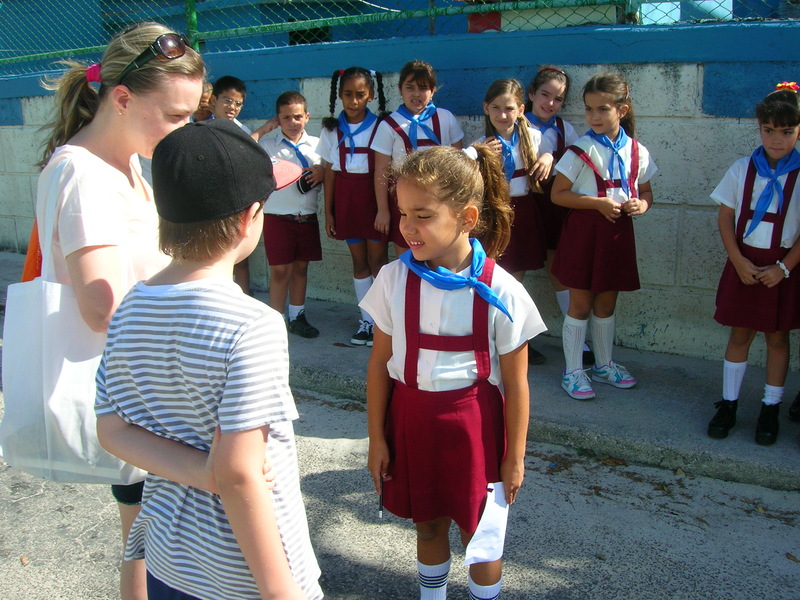 Imagine: the school is virtually on the beach, just off the main strip in Varadero! Idyllic setting, with palms and lush vegetation in the backyard. My Grade 3 son spent the next 30 minutes making acquaintance, singing and playing with the beautiful Cuban kids from Grade 2 at the Varadero school. We left a bunch of English kids books for them, and a few presents. Speaking of the Cuban kids: like any other kids in the whole world, they are blessed with being oblivious to all the issues around them. All they want is to play and play and… play some more! 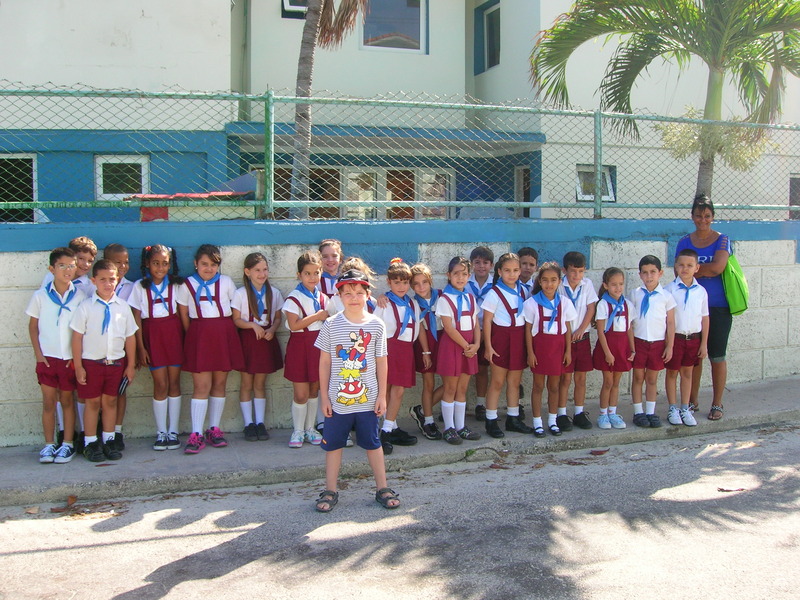 Grade 2 students at Varadero School, putting up a little show for my son, close to the school’s entrance. One of the most beautiful beaches in the world is virtually at the back of the school. 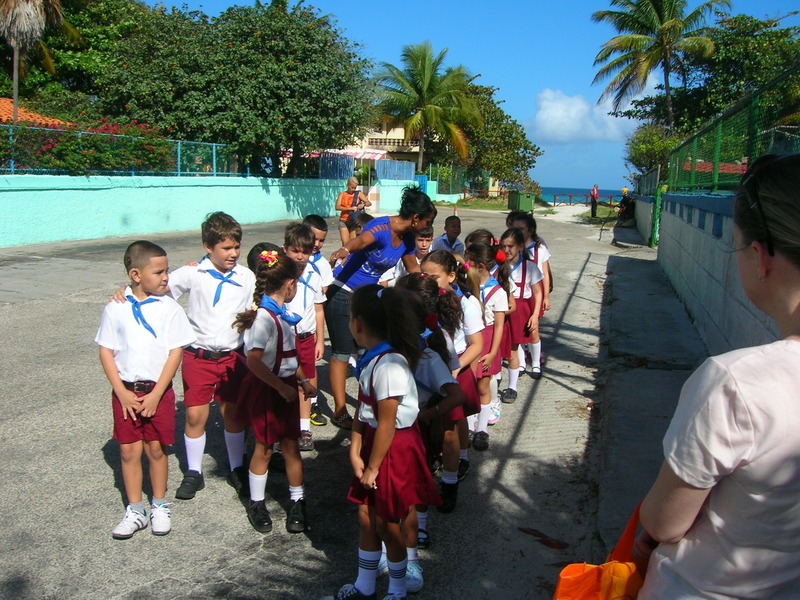 Posted in English blog and tagged as beach, children, Cuba, Cuban, featured, kids, public, santi, school, students, Varadero. Very cool George. A unique experience for all involved.